Already a classic in the genre, Do What You Are has helped hundreds of thousands of people find truly satisfying work. 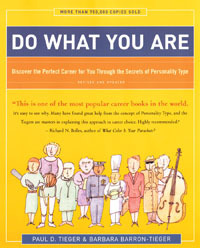 Do What You Are introduces Personality Type - how you process information, make decisions and interact with the world around you - and shows you which of the 16 types describes you best. It lists dozens of occupations that are popular with people of your type. Then, using workbook exercises and real-life examples to highlight the strengths and pitfalls of each personality type, it shows you step-by-step how to use your unique strengths to customise your job search, ensuring the best results in the shortest period of time. And if you plan to stay in your job, Do What You Are provides savvy advice for getting the most out of your current career. Every other career guide offers generic, one-size-fits-all advice. But because it is based on personality type, Do What You Are helps you determine what you need to be more successful and satisfied.